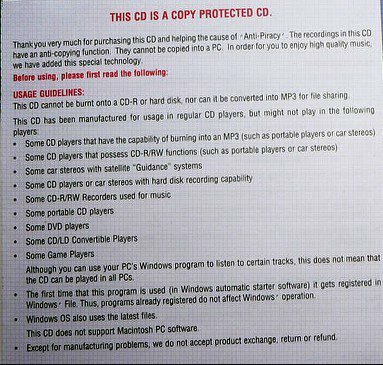 Following the drm rootkit PR disaster for Sony BMG, the producers of Coldplay's latest CD have decided to include an insert explaining all the things the drm on the CD might restrict purchashers' doing with their new CD. You want to do what?!! Play it on that expensive new CD player with recording functions you got for Christmas? Nope. In your new car stereo? Nope. Your portable CD player? Nope. You want a refund because that CD you purchased won't play on your equipment?! Tough. Use it as a coaster, "we do not accept product exchange, return or refund." I'm not a lawyer but I can't see these restrictions surviving a real test under the UK's Unfair Contract Terms Act. Though it's along time since I studied it I believe it has clauses to the effect that vendors can't use small print to avoid their legal obligation to provide goods of satisfactory quality. There may even be a clause in there that says it is an offense to use an exclusion clauses to try and restrict consumer redress on goods that are not up to scratch or plain just don't work. It's this kind of unadulterated claptrap that gives the music industry and their lawyers a bad name and it's about time they got appropriately challenged on it (and not just in France, where to their credit, the courts have declared certain types of drm illegal). Thanks to Cory for the heads up.